Hello! Erin Hodges with Fig + Cotton, here with the next Effortless Entertaining installment. Today's post is all about what to stock in your "hostess closet." For truly effortless entertaining, one must be prepared to throw a party in a pinch. This means always stocking easy appetizers in your pantry or freezer (click here for ideas! ), having a chilled bottle of cava on hand, and creating a well-stocked "hostess closet." This closet I speak of can be under the bed in your guest bedroom, the top of your pantry, or wherever you have the space to keep your entertaining arsenal. I promise that having easy access to pretty cocktail napkins and plenty of champagne flutes can certainly ease your nerves when you decide to have an impromptu happy hour on your back porch on that first true Spring Friday. 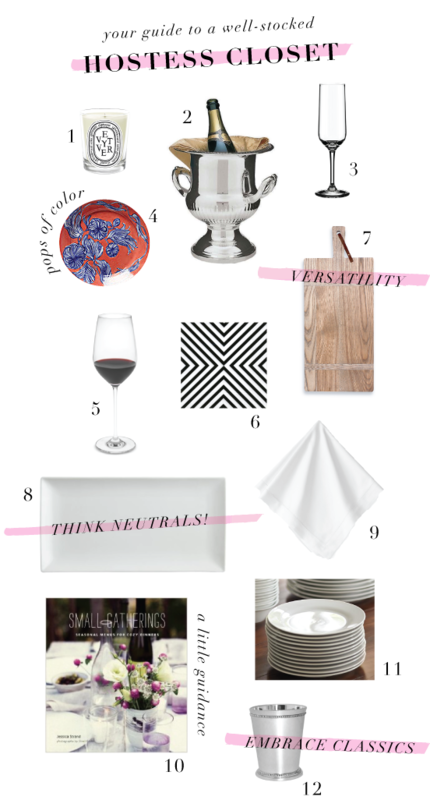 Below are my picks for effortless entertaining! 1. First impressions are essential. These Diptyque candles will make sure your abode is pleasing to the nose! 2. A beautiful silver champagne bucket will definitely make your guests feel special. Use this one to hold orchids in between your soirees. 3. I love these Ikea champagne flutes. They hold a lot of bubbly, keeping your guests happy. 4. I definitely think that white serving pieces and linens are a must when trying to be as versatile as possible, but every gathering needs some color. These anthropologie plates as just that. 5. As far as wine glasses, I say this is where your splurge a little. Beautiful stemware can really make a difference. 6. Playful cocktail napkins are a must. These are just perfect! 7. A great handled cutting board is one of my favorite serving pieces. Think cheese plate, fruit for cocktails, and bruschetta...just to name a few. 8. A bevy of good-quality white serving piecing will make your life easier. 9. Good-quality, white linen hemstitch napkins are a great investment. If those are out of the budget, try these. 10. You can't have a gathering without food. Surfing the web will give you some great appetizer inspiration (try this Fig + Cotton post for easy appetizers), but sometimes there is no replacement for a beautifully-styled cookbook. 11. Pottery Barn makes a great catering set of white dishes that are great quality and go with everything. 12. Finally, a set of classic mint julep cups can dress up any bar filled with stir sticks and straws. Also, they make the best vessels for small flower arrangements. I hope everyone is staying warm in this crazy winter weather! Love all of your picks. I just found really great neutral white large serving platters at Target - they were on clearance (so great buy) but still look so elegant. I just posted a recipe and used them in the post (if you'd like to see them). Love Target! I love Diptyque candles, and those Anthropologie plates are adorable! I love that pattern and color combo! Great items! I always am buzzing around during a get-together and never get to actually enjoy spending time with my guests. I just don't have the right hostess things. Now I have a shopping list.